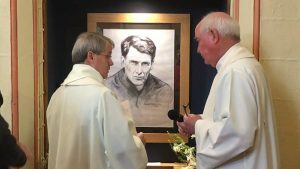 The Mass of Thanksgiving for the beatification of Fr John Sullivan SJ took place in Clongowes Wood College, Co. Kildare, on Saturday 20 May. It was a prayerful and joyful occasion for the locals so loyal to his cause, and for those who had travelled from further afield. 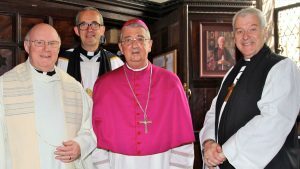 The Eucharist was celebrated by the Most Reverend Denis Nulty, Bishop of Kildare and Leighlin, with many Jesuits in attendance, including the Irish Provincial Leonard Moloney and Fr Victor Assouad SJ, representing the Jesuit Father General, Arturo Sosa. 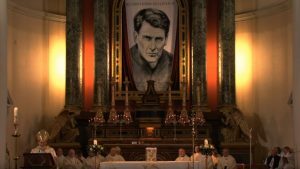 In the lead up to the Mass, Fr Donal Neary SJ led the crowds streaming into the sports hall, in prayer and reflection on the life of Blessed John. He noted that people coming to the Mass had walked or driven up the same roads that Father John had often tread on foot or by bike, visiting the sick, the suffering and the poor all around Clane and Kildare. 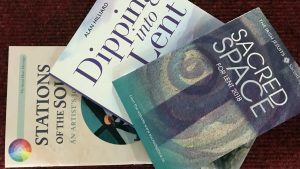 The whole event was live-streamed to a marquee in the garden and to the People’s Chapel, where many of the congregation, including the sick and the elderly, had also gathered. In a moving few moments, a number of relics associated with Fr John were carried to a small table near the altar. They included a piece of his hair kept by his fellow Jesuit Fr Barrett. 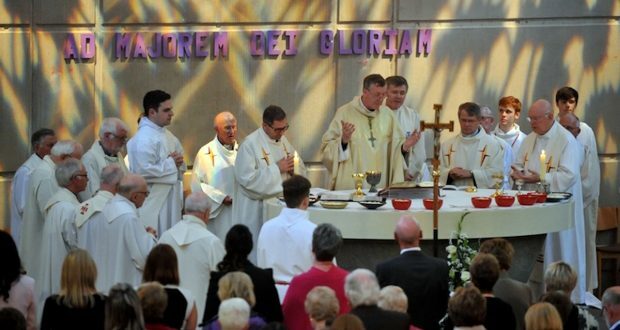 Fr Barrett had acted as barber for Fr John and knew in his heart he would one day be a saint. Other relics included: the cross off the top of his exhumed coffin; an etching of Fr John, now hanging in his room at Clongowes where the chaplain works; and the cross he carried when he visited the sick and the poor during his twenty years in Clongowes. 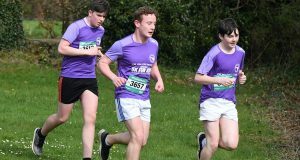 The last of these was brought to the table by a teacher from Portora Royal High School in Enniskillen, where Fr John went as a young boy. (See photo). 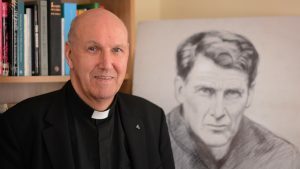 During his homily, Bishop Nulty said he had read all the material that had been submitted to Rome in the case of Fr John and was in no doubt that he was a true Blessed. He urged all present to continue to work hard for his canonisation. 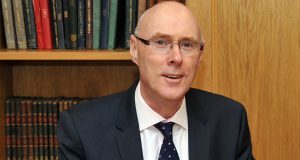 He also spoke about being in Carlow and going through a directory of all the priests in the diocese over the centuries. 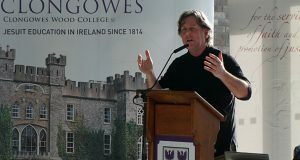 Fr John’s name was listed a humble third from the bottom of all the men in the Clongowes community at the time, he said. 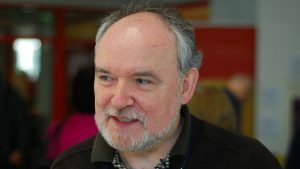 Conor Harper SJ, Vice-Postulator for the Cause of Fr John, read a touching letter from Peter Lloyd, a family relative of the Blessed. 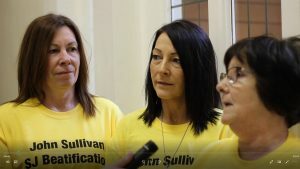 Peter said he was speaking on behalf of all his family when he expressed their deep regret that they could not attend the ceremony. 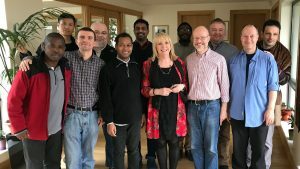 He said that on all the occasions when they had come to Ireland they were overwhelmed by the greetings and gratitude that they received from people. 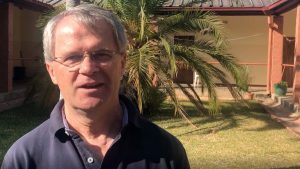 But, he said, it was he and his family who were truly thankful to be part of such occasions and to represent the Anglican side of Fr John’s life in the spirit of true ecumenical friendship that was such a hallmark of the celebrations. 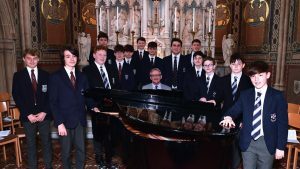 The liturgy was significantly enhanced by the singing of the Clongowe’s choir, Schola, under their liturgical director Mr Cyril Murphy. 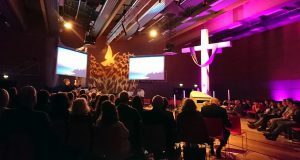 The whole congregation joined in the singing, aided by the presence of large screens projecting the words of the hymns with accompanying pictures. At the end of the Mass, Fr Michael Sheil SJ, rector of Clongowes and one of the event organisers, invited people who wanted a blessing with one of the relics to come forward. Many did so. Afterwards a large crowd packed into the college canteen for refreshments at the invitation of the headmaster, Mr Chris Lumb. There was a great ‘buzz’ all around and a real sense of history among those present. This was a day for which many had worked hard and waited long.